Trooper’s surprise birthday party saw 18 kids huddled in a stable waiting for the birthday girl to arrive on horseback. The surprise nearly knocked her off her horse but the joy on her face could not be wiped off all day. The day saw quad bikes speeding through the gardens and mud tracks while us adults waited with baited breath and stomachs in mouths for something to go wrong. 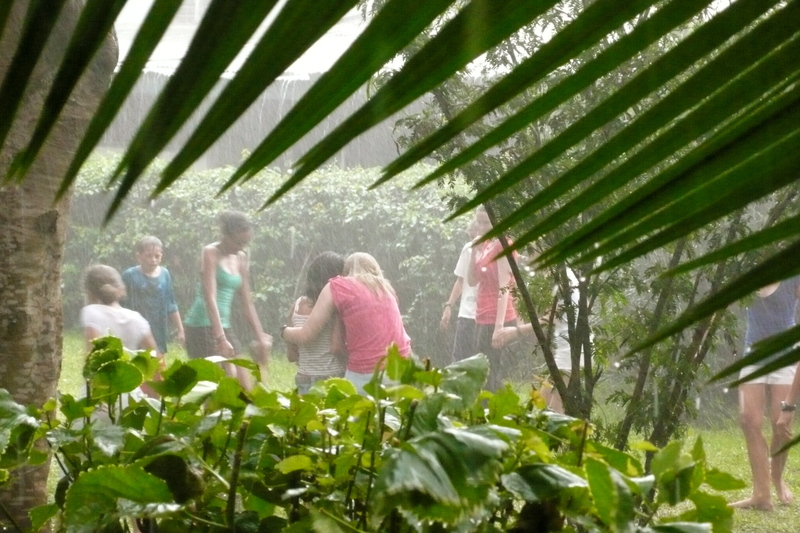 The day heard the laughter and glee of 18 kids as they ate cake, tucked into snacks, ran amok and danced in the rain. 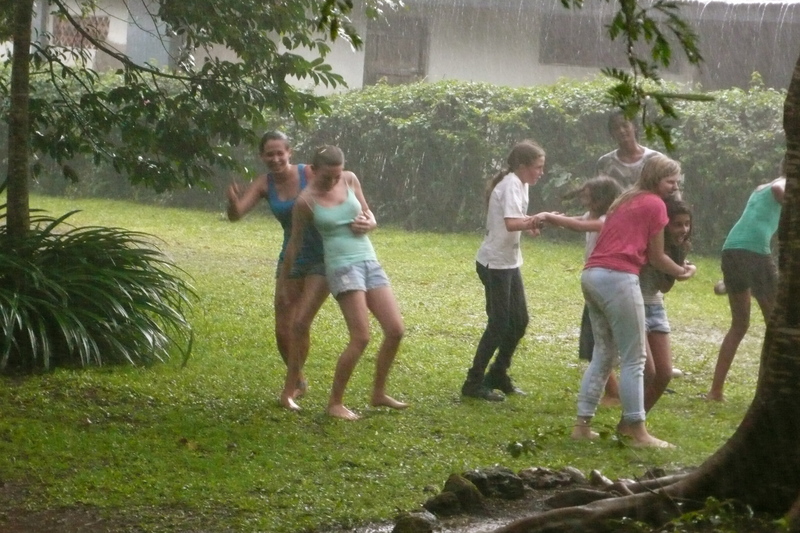 There are few things as fabulous as dancing in the rain without a care in the world. Yes, they were covered in mud and damp for the remainder of the day. But wasn’t it worth it? The birthday girl has been welcomed to her teens in true style, with the love of friends and plenty of fun in the mud. I am happy to report that the surprise went off without a hitch and was deemed a huge success by all. It is a straight road from Graduation to Zebras. We are facing a mini whirlwind of events in the world of 3limes. This morning the graduating class at our school marched through the entire campus and past every student, from the wee 2 year olds to the weary and so-over-it 17 year olds, to the tune of Pomp and Circumstance. They were showered with tossed roses and applauded for their achievements. Even the most hardened cynic could not fail to be moved. I am especially pleased since it was I who brought this procession idea, having enjoyed it so much at my last school in Trinidad. It is a worthy tradition that gives the little younger ones pause for thought and dose of honour and the graduates respect and lashings of pride. Tonight I will attend the Graduation ceremony where I will sit and remember the festivities of last year. The last Graduation I attended took place on my very last night in Trinidad and I sat through it in a daze of tears and pre-emptive nostalgia. I sensed I was sitting in a movie that I had already seen; it was an out of body experience and the heightened emotional state caused both by the sheer quantity of goodbyes and the tearful but fabulous party afterwards formed a psychedelic imprint on my memory. This Grad will not be in any way emotional, I don’t even teach any of the students but instead will be a precursor and perhaps even excuse for the 70’s party I am attending afterwards. Then tomorrow morning I will peel myself off my bed and prepare for Trooper’s surprise party. She still has no idea and I hope it stays that way. I must confess I am failing as a domestic goddess as her cake will be purchased for the first time in her life. But how can I bake without revealing the surprise? Tricky. Next week I will attempt to prepare my classes for exams but I think their unusual attire might prove a mite distracting both for them and me. It is Spirit week and for three days teenagers will come to school dressed as movie stars, wearing crazy wigs or boxers around their necks and finally even in their pyjamas. Do I need to dye my hair orange too? Will my pyjamas be revealed for all and sundry? Luckily the amusements will only last three days and shortly after I will be skidaddling off on a Mini Break. This time next week I plan to be horse riding with Zebras. I ruined a perfectly pretty pedicure by wearing closed shoes and dancing up a storm. I think at one point I may have stepped on a dog and caused a dog fight. The night was gentle and starry at first, the martinis flowed, the food arrived, the music got higher and things became rather interesting. There were silent dialogues flowing above our heads and beneath the table all evening long; there was verbal sparring easily confused with foreplay, there were tears, recriminations, flirting and dirty dancing. Oh what a night. The next day beckoned and with it a BBQ. Characters were tossed and delivered into a beautiful garden overlooking the city. If you tilted your body to the left next to one of their trees you could even see the lake. I met new comers to Kampala, people who were leaving, old timers who had seen it all; I met travellers, actors, the beautiful and the dammed. Food was divine, so was the wine and without a glance at a watch a midday lunch ended at 10pm. There was gentle chat, laughter and garden games. Then stolen cigarettes and cocktails as it grew dark; it was a very happy day. Sunday and our stamina looked weak. We were operating on less hours of sleep than we needed and through our veins flowed more wine than blood, but we did it again. Another BBQ, this one more tame but a social activity never-the- less that was celebrating the achievements of one friend. It was a totally different crowd, no scary unspoken drama, just a lovely dinner. Coming back to school feels like a rest. Next weekend? Surprise birthday party for one 13 year old. I work with adolescents and I live with an adolescent. Trooper will be 13 in less than a week and she is turning into a woman before my very eyes. I can see her moving gently away from me with her secrets, her ideas, her hidden stories; until she creeps back for the occasional cuddle or late night chat. She has changed her facebook status. It now reads: “In a relationship.” Putting that up for the world to see was an heady moment for her and one she waited for. She didn’t want to go first, he had to make the statement public before her, but just seeing it up there is a rite of passage that I never had. So now she enters a new era of scorching heartbreak and searing joy. I can no more wrap her in cotton wool and smuggle her into my bed than protect her. She must tread this path alone but know that I am beside her all the way and always on her side. A good friend who goes way back into the nether reaches of my past just signed up her daughter for kindergarten and I am sure she is feeling the tug of apron strings as her sweet baby will soon proudly don her backpack and head for the gates. We go through so many steps as parents, each one a tiny goodbye as the strings pull back and forth like a struggling and stubborn fish not wanting to be caught. Living in a mini United Nations with maple syrup and Masai Warriors. Poor 3limes has seen the brunt of my negative energy recently. I cannot display roses and smiles when living here is not always so; however this week things seem a little rosier. So this little fish tried yoga and this little fish did indeed bite. The class did not feel anything like exercise despite the fact that my body was stretched and pulled more than it has ever been. Unlike those painful minutes on the treadmill wondering how much longer I would need to endure the pain and boredom, I never once wanted the class to end. There were moments when it hurt and I sweated and felt my heart beat, something that doesn’t often happen in my day to day life between shoebox and school, but it was enjoyable and felt so so good. Plus the class is run by a most extraordinary woman with a wise, open and gentle presence and her home was up high on a hill with a view and a lush garden. There were candles and flowers and everything was quiet and peaceful and calm. I can’t wait to go back. 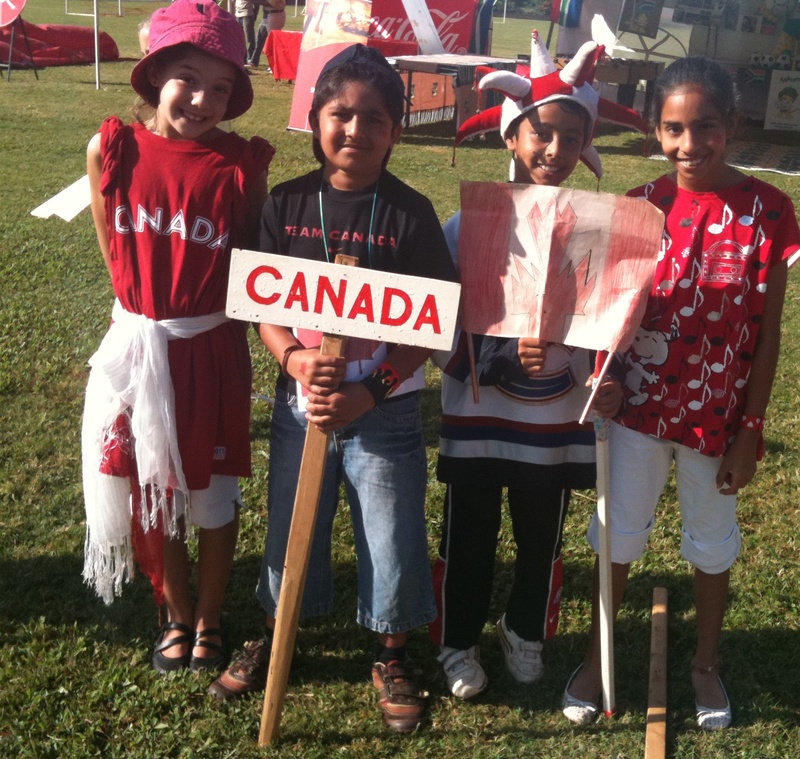 This morning Primary celebrated International day with a parade of nations around the big field. I have no idea why secondary was not included in this amazing event, but if I have anything to do with it, they will be there next year. Despite missing the parade most of my students came dressed in a spectacular array of traditional costumes or bearing the colours of their flag. Within the four walls of my classroom I have been transported to India, Egypt, Kenya, Lebanon and Afghanistan. Football shirts from Ireland, England and Scotland have been displayed and one or two Masai warriors came by to say hello. International day reminds us all of the great advantage of teaching and attending an International School. My daughters and my students have friends from all over the world. Each day they live life within a mini United Nations and they are taught acceptance and tolerance at every turn. Most importantly we are all educated, constantly about what each country has to offer and how no custom, practice, costume or food is better than any other. It is an education in the very best way. Handsome husband is flipping pancakes in the Canadian tent and has even donated some very precious maple syrup for the event. Everyone is smiling. This is why we live this crazy life so far from home. It takes days like this to remind me. Yet another mini vacation opportunity presents itself. We have a long weekend coming up in June and I cannot wait to get out of Kampala, pick up my camera and find something other than musicals, dead dogs and casinos to write about. A four day weekend is too short to go to Queen Elizabeth Park and although just perfect for Murchison, having been there quite recently, I am eager to try somewhere new. So we need to look within a 4-5 hour radius of Kampala. Sipi Falls is perfect, but again we have done that. Jinja is best left for a simple weekend break and although a flight to Mombassa could work, it is rather expensive. There is a place called Lake Mburo and whispers have been made about a trip out there. I am not a camper, I have said this many times before. I thought that camping on the Delta for New Year’s Eve, under a full moon; totally exposed with the thrill of animals nearby was a highlight of my life as far as experiences goes. But it was an exception, and certainly not the beginning of any love affair between me and a tent. However we have very good friends who are very serious campers. They have all the kit, including means of cooking and washing and living in the great outdoors unaided by any luxury and they want us to become campers too. So tell me. Why can’t I just bite the tented bullet and sleep in a tent, feel mucky, eat food cooked and later washed up over a campfire? If the world is divided into those that camp and those that do not (and in my opinion I see two very distinct groups amongst the people I know) then I am in the latter group and this is not something I can change. You really need to love the experience and while I respect and even admire those that embrace the tenting life, I just don’t get it. I find it uncomfortable. This goes deeper than it seems and I cannot suddenly slip on a new skin and become something I am not. Is there any shame in admitting that I am a bit Princess along with my inner Trooper? I replied that I had never camped in Canada. With the greatest respect, we come from different worlds. So we now have a quandary as our 4 day break swiftly approaches and I am being regarded as a stubborn and odd bird. I am looked at despairingly, as a spoilt girl who ought to know and do better. I must mention that both Princess and Trooper simply adore camping. Perhaps that is the clue. I never once camped as a child and perhaps it is now too late? Perhaps they can sleep in a tent while I flourish in a Lodge?